The city of Bastrop, Louisiana, burgeoned with the growth of railroad commerce in the late nineteenth century. Before then, the movement of goods through this area relied primarily on rivers such as the Ouachita, Red, and Atchafalaya, all of which branched off the Mississippi. Boats navigating upstream brought vital supplies to these emerging settlements and in turn carried shipments of produce and cotton back down to New Orleans. As railroads were constructed through Louisiana’s northern parishes in the 1880s and 1890s, however, settlement patterns changed significantly. Many small towns experienced a precipitous rise in population and, as a result, economic opportunities sprung up throughout the northern part of the state. Bastrop, nestled in the northeast corner of Louisiana, grew rapidly after the construction of a railroad through town in 1892. At the same time, a small Jewish community blossomed in this growing town. By the turn of the 20th century, Jews in Bastrop had formed a congregation, erected a synagogue, and operated some of the most successful businesses in Morehouse Parish. Over the next five years, the membership at B’nai Sholom doubled as they planned for the construction of a new synagogue. The schoolhouse property, which had served as a de facto temple since the congregation’s inception, was raffled off in May 1885. Mrs. Edelia Goldman bought the winning ticket, but under Louisiana law, “married women could not buy property without the consent and authorization of her husband or, in his absence, by the Judge.” As her husband was traveling in Europe at the time of the raffle, the judge issued her the deed to the property. The new synagogue was constructed soon thereafter on a donated plot of land at the corner of Walnut and Washington Streets. At its dedication, Rabbi Bien of Vicksburg, Mississippi, Judge J. Harvey Brigham of Bastrop, and congregation president Abe Oehlber delivered laudatory speeches. The handsome brick temple served as a meeting place for the Jews of Bastrop for the next 40 years. Unfortunately, by the 1920s, the community that the Jews of Bastrop had spent the last half-century fostering had begun to deteriorate. The state had constructed a gravel road, today’s State Route 139, between Bastrop and Monroe, a much larger city 20 miles away. In the early 1920s, many members of Bastrop’s Jewish community moved into Monroe to pursue new and exciting economic opportunities. Those who stayed behind in Bastrop were unable to sustain B’nai Sholom. By 1923, the congregation disbanded and the approximately 30 Jews left in Bastrop joined B’nai Israel in Monroe. Furniture and moveable items in the abandoned temple were divided among former members of the congregation. The stones in the sanctuary bearing inscriptions of the Ten Commandments were buried in the Jewish cemetery to prevent desecration. In 1939, the temple was at last demolished after a paving dispute had led a local court to order that the abandoned property be sold. 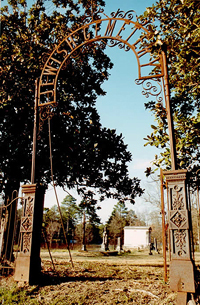 Most remains of B’nai Sholom and its history were discarded; however, the two pulpit chairs from the sanctuary have been preserved in the Snyder Museum, an institution dedicated to preserving the history of Morehouse Parish. Around the turn of the 20th century, Jews founded several important businesses in downtown Bastrop. August Leopold, son of German immigrants, arrived in Bastrop after growing up in New York City. He opened a dry goods store in the 1890s and soon thereafter opened a downtown saloon famous for serving “whiskey that wouldn’t freeze,” implying that the proprietor had not diluted the alcohol. This claim was verified during one particularly cold winter when his competitor’s whiskey froze while his own supply remained potable. August’s reputation as an honest businessman paid off; in later years, Bastrop’s citizens elected him as the town’s sheriff. Other Jews operated large retail businesses in Bastrop. Charles Snyder, a Russian immigrant who arrived in Bastrop in the early 1890s and peddled for several years, opened a department store in Bastrop’s commercial center, the courthouse square. He also operated Snyder’s Thrift Store adjacent to his department store. His three sons, Samson, Sol, and David, each owned their own stores. 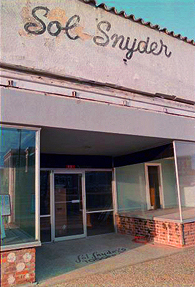 David Snyder’s furniture store proved to be one of the most successful in Northeast Louisiana. By 1950, stores operated by members of the Snyder family occupied three of the four sides of the courthouse square. Unfortunately, all of these businesses have closed in recent years. Charles Snyder’s home in Bastrop’s residential district now houses the Snyder Museum, which was named in his honor. While there is no congregation or organized Jewish community in Bastrop today, the influence of Jews on its development is still felt today.